CHASING FOOD DREAMS: Ramblings of a Cocktail-holic! I was never much of a drinker throughout my life. Nope, I am not a party pooper but I just don’t feel the need to have to drink to drown my sorrows or pump up my happy adrenalin! I do admitting to enjoying several glamorous cocktails and beverages once in a while or special celebrative occasions though out my journey of gluttony. Looking back, I am still searching for my list of the perfect cocktail for me! It’s true that people say when your age changes, your taste also changes. Searching for my past, I seemed to vaguely remember that cocktails were my thing while beer was not. My taste seemed to hit the bitter note when it comes to beer during my 20s. Hence, I could never understand why beer lovers enjoy this bitter beverage. On the other hand, if the alcohol is perked up with mixes, then I seemed to not get enough of it. Leading to my question, do I seem to prefer sweeter alchohol beverages? I tried hard liquor on the rocks and boy-oh-boy, I could feel my throat burning. Then I had this mixed with soda and suddenly, this cocktail is delicious! I guess the sweeter soda tones down the hard liquor, making it easier on my taste bud. It was then that I began to enjoy cocktails, most of every kind that I can get my hands on anyway. Fast forwarding to my 30s, taste changes again! The frightful beer notes were beginning to taste better and somehow, I felt it was less bitter than before. I also learn to appreciate the smoothness of the beer and the body of its flavor. In fact, as I continue to enjoy them, I began to realize that it can be really a darn good beer! Now if I am offered a beer, I simply can’t say no. My old favorites are Vodka with Lime served on the rocks, Tequila Sunrise and Margarita. There is just something soothing and tingling about these classics. The mixes just works and the flavors seem to feel really comfortable on my taste bud hence there are just days when I really feel nothing works except for classics. Lately, more unusual cocktails have appeared and bartenders or mixologists are getting so creative! With all the fusion going on in the food industry and the awareness of international cuisines, there really is infinity of cocktails available in practically any food restaurants or bar. These also come with groovy and funky names to boot! Now don’t get me wrong, I haven’t turn alchoholic yet! I just learn to appreciate and accept newer stuff in life. Yeah, I am bit slow but hey, better late than never. Some modern cocktails I had recently have bumped up my list of favorite cocktails and alcoholic drinks. Leading the top is a recent discovery at a Japanese restaurant called Ume Margarita. Utterly divine, the pickled plum really amped up the flavor notes of a margarita. It is bold and strong, hitting all the right senses in my neurons, sending sensational goose bumps to my brain. Super tangy and really smooth on my palate, I love this new cocktail. Who would ever have thought to use Japanese pickled plum to concoct a margarita?? Another unusual cocktail I thoroughly enjoyed with bliss is a Hazelnut Caipirinha. Now this cocktail comes with much entertainment… a cinnamon stick in the drink is torched up right in front of you! Well though I admit to being entertained, I was more pleased with the gorgeous flavor of the Brazilian national cocktail with a twist. Made with sugarcane rum and lime, it also has a nutty note of hazelnuts. I had quite a few of these that night and thought the hazelnut flavor was brilliant! Well, the list can go on and on… from signature Blue Martini to Geisha Martini, Absolut Bling to Limoncello Collins, Prosciutto & Melon to The Mohawk and to some other funky named drinks with unusual ingredients, all I can say is just get adventurous and try them all to see what tops your list! Come on… tell me what is the most unusual cocktail that you have had before? 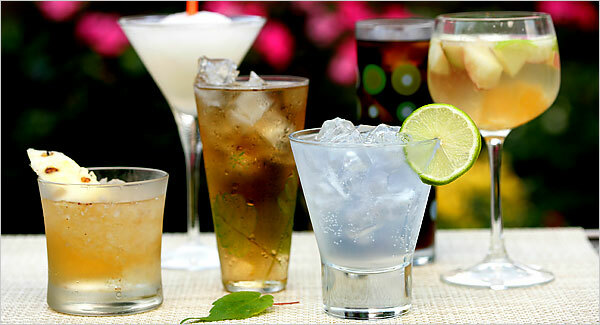 Drinks look lovely want to a sip of ever drinks. I love drinks and one of my friends taken Famous Bar Franchise in its bar variation of drinks are available. I like to go its bar and have fun and drinks. It's true that bar attract their customer by its drinks.